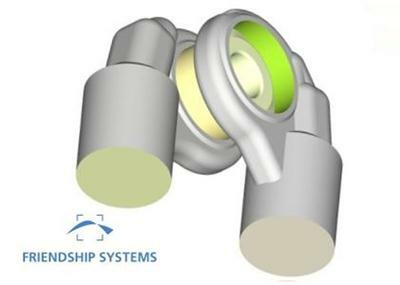 FRIENDSHIP SYSTEMS released a new maintenance version of the CAD and optimization platform CAESES. With CAESES we strive to provide you with the most robust and reliable CAD solution for automated simulation studies. In this first 2018 release, the internal geometry engine got a major update for advanced CAD modeling of complex and challenging shapes. In addition, we offer a new Parasolid export and a separate ANSYS add-on (ACT app) to plug CAESES into the ANSYS Workbench. Check out all the details - as well as important compatibility issues - and download the new version! The CAESES geometry kernel received many great improvements both in terms of robustness and performance. There are also new features available, such as selecting solids based on their surface area. It allows you to always choose the same solid after the operation "Solid from Intersection". The former default setting was an unsorted list of generated solids where the order could potentially change in some situations during automated studies or optimizations. In the context of curves and surfaces, check out this new feature for the interpolation curve: In addition to a list of points to be interpolated, you can also now set tangent information for the interpolation curve. For each input point, optionally use the squared brackets for creating a list, and then add the angle in degrees right next to the point or vector. We are now offering a new add-on that allows you to export geometry by using the SIEMENS Parasolid format. So far, design results have been automatically loaded into CAESESВ® as soon as you click on a design in the tree or the result table. However, in situations where your result data are huge (which is often the standard situation of our customers), you potentially wait for several minutes until the data is loaded into the user interface. This can be annoying if you e.g. accidentally click on the design, or if you only want to check the design's variables and constraints setup. In the new version, we decided to modify this behavior. As a new default, results are now loaded into CAESESВ® only on demand, which is a substantial change. There is a new icon next to the design name to click on, which triggers the data loading. With this new CAESES version, we are releasing solutions to seamlessly integrate CAESESВ® with the ANSYS Workbench and optiSLang. We have moved our CAESES-ANSYS app from the beta phase into a productive phase: The fsc-script from CAESES now contains additional information that allows ANSYS users to easily connect CAESES to the ANSYS Workbench, and to automate geometry generation through the GUI of the ANSYS Workbench. There is a new tutorial available that explains how this integration works. The new CAESES-optiSLang add-on is now also available, to plug CAESES into optiSLang. It provides fast access to the CAESES model parameters (i.e., the design variables) directly within the optiSLang GUI with just a few clicks, to control the automated geometry generation. About CAESES FRIENDSHIP-Framework. CAESES stands for "CAE System Empowering Simulation" and its ultimate goal is to help engineers to design optimal flow-exposed products. This software solution provides you simulation-ready parametric CAD for complex free form surfaces, and targets CFD-driven design processes. These specialized geometry models are perfectly suited for automated design explorations and shape optimization. About About FRIENDSHIP SYSTEMS GmbH. FRIENDSHIP SYSTEMS is a German software company with the core team being based in Potsdam, Germany. Our passionate team develops the software CAESES which targets simulation engineers (mainly CFD) but also anyone who is interested in intelligent surface design for automated design explorations and shape optimization. With many years of experience in the field of flow-related shape optimization and our proven software platform CAESESВ® in the back, we are able to provide solutions for virtually every problem and bottleneck that a customer might encounter when setting up his optimization process chain.